Summer in Melbourne is drawing to a close but that’s no reason to miss out on all the bayside fun that St Kilda has to offer. 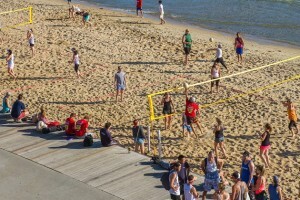 St Kilda Beach is not only famous for its perfectly situated restaurants and bars, but also for its sports both on the sand and in the water – and occasionally in the sky. There’s always something going on down at the foreshore and we’ve put together a list of some of the best beach activities for a sunny day. St Kilda Beach is the perfect place to practise your digging, and we’re not talking about building sand castles! Each Tuesday, Wednesday and Thursday evening, the volleyball nets go up on the sand and play begins. Better yet, Republica offer pizza and a free drink to every participant, but you do need to register! Everyone is invited, so no matter if you’re an expert spiker at the net or a first-timer with the volleyball, there will be a spot reserved for you on the sand. For water babies, there’s no shortage of ways to get in amongst the salt and the surf at St Kilda Beach. The waves might not be big, but that only means that surfers of any level of experience can join in the fun. Even the kids are welcome to learn a thing or two about the surf! 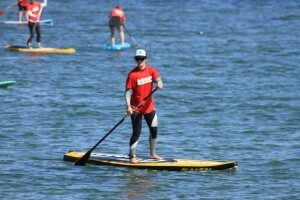 Stand up paddle-boarding (SUP) is the latest craze hitting shores all over the world, and there’s no better place to begin than on St Kilda’s famous foreshore. Difficult to master but highly addictive, the instructors on the beach will soon have you cruising around the bay every weekend. For those looking for a more fast-paced challenge, why not try your hand at kite or wind surfing? Jumping on a board of any kind is the most fun you can have by the bay, so be sure to chat to the experienced instructors at The Kite Republic SUP centre or Kite Republic about your first lesson. This is one for the adrenaline seekers. 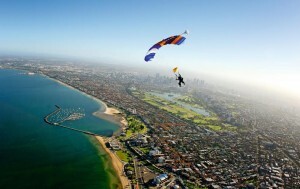 Plunge tandem from a plane at around 14,000 feet while taking in the spectacular vistas over Port Phillip Bay. A bucket list item ticked off for the most extreme daredevils! If you’re up for the challenge of all challenges, contact Skydive Melbourne to book your place and experience a unique beach experience like no other. 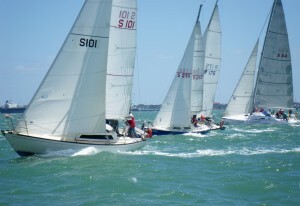 For an activity at a slightly slower pace, why not jump on a boat? If you’ve ever wondered what it would be like to sail the open seas, now is your chance with the Royal Melbourne Yacht Squadron providing a number of beginner courses, even for the kids. If a spot of fishing is your idea of a Sunday morning, you’re in luck. Call your mates or bring the family along to St Kilda pier early in the morning ready to climb aboard one of the second to none fishing boats with the team from St Kilda Fishing Charters . Be sure to give them a call in advance to make your booking. By now, you’ve earned some time out to take in the sea breeze perhaps over a drink or two. Grab a bite to eat from Captain Baxter’s tempting summer menu, wind down to some acoustic tunes at Riva or be mesmerised by an unbeatable sunset from Republica’s deck. It’s the laid back lounge vibe of these bayside bars that really make the beach come alive in the evenings. 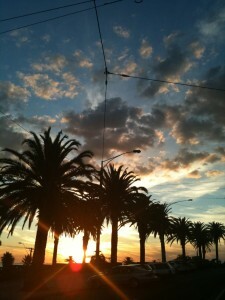 From dawn ‘til dusk, from extreme sports to total relaxation, there is something for everyone by the bay in St Kilda. You’ll be hard pressed to find a more entertaining day out anywhere in Melbourne.